Owned by my partners family since 1947 at least and devoid of a certifiable provenance. 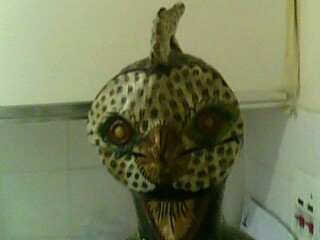 This Decorative ceramic owl jug is hand painted to represent a “Gallus gallus” or is it an Owl. It fell into no particular category among their numerous collections. It seems to me to have been bought and kept for no reason other than its beauty. It was referred to as the owl until I pointed out that owls do not have a comb. I have since accepted that chickens do not usually have handles on their backs and that the “COMB” might just as easily be the “handle” for the lid. 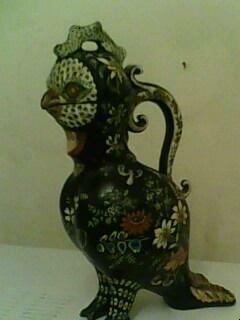 So, is this decorative ceramic jug a “Gallus gallus” or is it an OWL jug? And who might be the designer or manufacturer? 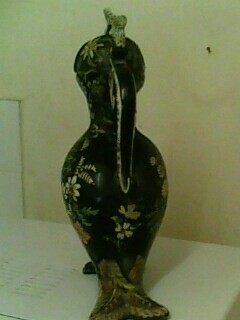 Any help on defining its origins would be gratefully accepted. That is absolutely wonderful. No idea where it originated but really do love it. It does look rather mythological particularly the body shape and the legs. Stirring something buried deep in my memory bank. Will be back once the old brain cells warm up.